Progressive insurgents lost to establishment picks in Texas’s runoffs. What does this tell us? 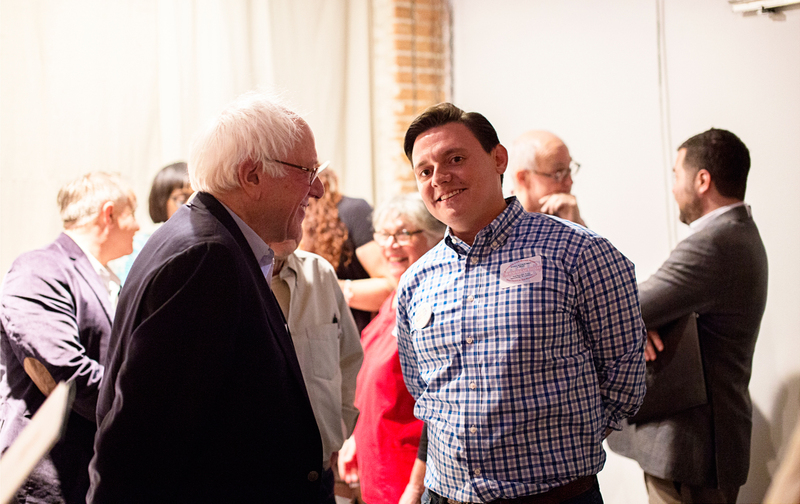 Rick Treviño campaigns with Senator Bernie Sanders in Texas. First, the bad news. All three of the insurgent congressional candidates who faced runoff elections in Texas on Tuesday were defeated. Elections are what organizers call a “structure test”—a non-fudgeable way of assessing the strength of a campaign or candidate within a determined structure. In this case, that structure was the Texas Democratic Party electorate, and Laura Moser, Rick Treviño, and Mary Wilson each came up short. Doubtless there were individual factors in each race, but the numbers don’t lie. What they tell us is that the left in Texas is far from being able to make a serious challenge to the state’s Democratic Party establishment—at least when that establishment is backed up, as was definitely the case here, by Beltway institutions like the Democratic Congressional Campaign Committee and Emily’s List. Jim Hightower, the father figure of Texas populism (and state chair of Our Revolution), who has been in this fight too long for wishful thinking, told me he was worried that, despite their success in getting past well-funded opponents to make the runoff, and their talent and enthusiasm, these candidates may have been “running for the wrong races. Running too high on the ballot.” Which is why, although the group endorsed in these races, Our Revolution kept its own financial and organizational focus on the state legislature, county commissioner (in Texas an enormously influential office), and other contests further down ballot. Now we know that Hightower was right. There are also hard lessons to be learned individually. The first is that money still really matters. Rick Treviño and Mary Wilson were both outspent by 20 to one in the primary by their opponents, and although the final filings aren’t in yet, it’s probably safe to assume that ratio didn’t change much in the runoff. Running a shoestring campaign makes for a compelling story, but when it comes to reaching voters—especially in a district bigger than the entire state of New York—television and radio are essential. Successful GOTV operations are labor-intensive, and while that can be done entirely by volunteers, building an organization that can do that takes more than one congressional cycle. Being able to pay staffers and cover the expenses of surrogates helps, too. A way to compete effectively without selling out to corporate donors may have been found by Howard Dean and Bernie Sanders at the national level, but in state and local races, it’s still a big hurdle. Laura Moser ended up being brutally punished for her youthful insensitivity as a 20-something journalist 20 years ago—but she also lost to a candidate, and a campaign, with deeper, or at least more continuous, local roots. Moser’s national reputation as the founder of Daily Action meant she could raise money from small donors—but most of them were from outside her district. And though her campaign prided itself on movement building, her 2,000 volunteers only delivered a total of 5,600 votes—a showing that would embarrass a Chicago ward heeler. The good news is that Wilson, Moser, and Treviño are all talented, genuinely progressive campaigners—and the latter two are young enough to keep at this a long time. And of course those races were overshadowed by Lupe Valdez’s stunning victory over Andrew White in the Texas Democratic gubernatorial primary. Though she, too, faces an uphill battle against Republican Governor Greg Abbott, Valdez ran as a gay, progressive woman of color in a statewide race against a centrist male candidate. And of course Beto O’Rourke continues to wage a credible, well-funded, progressive challenge to Senator Ted Cruz. What Tuesday’s results don’t prove is that you have to run down the middle to win in Texas—or any other red state. Although the three winners all had challengers on the left, none of the winners can be accurately described as a “blue dog” Democrat. Gina Ortiz Jones, who beat Treviño, campaigned as an out and proud lesbian—and received strong backing from the gay community. Lizzie Pannill Fletcher, who defeated Moser, stressed her electability against Republican incumbent John Culberson, not her policy differences with her primary opponent. Even Joe Kopser, the former Republican West Point graduate who beat Wilson, calls himself a “progressive.” A victory by any of them would be a huge improvement over their Republican opponents—and a solid base for the ongoing struggle to drag the Democratic Party to the left. To do that, though, will take time, and money, and hard work. Starting at the top—or as close to it as a seat in Congress represents—is always going to be a temptation. If there’s a big wave election in 2018, it won’t bring the left to power—at least not in these three districts. But then, as we knew all along, real change starts from bottom up. Because when it comes to building real power—the kind that can not only win elections, but choose candidates and set policy—there really are no short cuts.